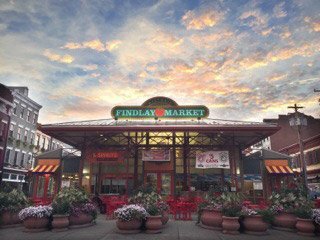 Findlay Market is ranked as one of five Great Public Spaces in the American Planning Association’s annual “Great Places in America” list for 2016. The Great Places in America program recognizes streets, neighborhoods and public spaces that are unique and exemplary in their amenities and infrastructure, cultural identity and use of sustainable and innovative practices. Findlay Market is the only survivor of the nine public markets operating in Cincinnati in the 19th and early 20th century. It is home to 42 full-time individual merchants and more than 50 outdoor vendors and farmers on Saturdays and Sundays.